Welcome to the world of premium! When it comes to a classical guitar, $1,000 can get you one of the best guitars on the market – something that’ll happily accompany you on stage, through recitals or just a home model you’ll treasure for a long time. What to Look for in a Classical Guitar Under $1,000? Should You Buy a Used Guitar? Some electric guitars and steel-string acoustics would only be deemed true premium if you spent $5,000 plus, but a classical guitar around $1,000 is considered pretty high-end. Therefore, your grand is able to buy you a lot of guitar! We’ve put together a chart highlighting five of the best classical guitars on the market in this price range, which you can check out below. Of course, it’s not a comprehensive list, rather a snapshot of some of the best looking, sounding and more interesting classical guitars you can find. Kremona surpass themselves with a special classical guitar, packed with tone. A quality nylon stringed classical beauty from the Godin family of builders. An advanced electro-acoustic classical from Yamaha, with excellent playability. Cordoba’s all-solid-wood C9 certainly deserves its place in this chart. Something a little different from LTD, with excellent playability. In this sub-$1000 price range, it’s not too difficult to find a classical guitar that plays and sounds great, although not many feel as special as Kremona’s Fiesta FC. As part of the Bulgarian brand’s Artist Series, their master luthiers craft this delightful all-solid-wood guitar using red cedar on the top and Indian rosewood on the back and sides. This pairing leads to a very warm tone, with good balance throughout the registers, as mentioned in the full review of the Fiesta FC. There are no electronics on this model, but the quality hardware adds to the playability and tone, with good Gebr. Van Gent tuners, a bone nut and saddle, and a very good deluxe Kremona hardshell case. 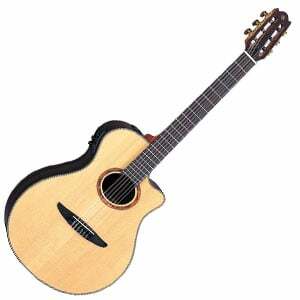 La Patrie’s Collection is a nylon string classical style acoustic guitar. Made with materials and hardware which are appropriate for a premium instrument that costs at least twice as much. La Patrie and Seagull are both from the Godin family, but they are in fact two separate companies that specialize in completely different types of guitars. Made with a combination of solid cedar top and solid rosewood back and sides that needs to be heard to be truly appreciated. Meer words cannot convey how beautiful this guitar sounds. The high gloss custom finish deserves special attention. It looks awesome, feels fantastic, and will allow your guitar to age naturally and only get better over time. One of the higher-end models in Yamaha’s super-playable NX series, the NTX1200R electro-acoustic classical is geared towards those players craving the feel of a steel-string, but with the core and tone of a traditional nylon-stringed guitar. The all-solid-wood body is made using a spruce top and rosewood back and sides, while the African rosewood neck has a nut width of 1.89”, so it’s slightly narrower than your standard classical. As we explain in our complete NTX1200R review, the electronics on offer are very advanced, with a two-way pickup system, and Yamaha’s versatile System 61 preamp, with a multitude of sound shaping capabilities. Acoustically it can be a little quiet, but the tone is – as you may expect – beautiful, especially when amplified. As we push into premium, it’s no surprise to see a Cordoba on this list. Their delightful C9 is proof of the superb craftsmanship of their Chinese workshop – it just feels wonderful to play, and sounds great to match. With a traditional design, the C9 is an all-solid-wood guitar, with a Spanish fan-braced Canadian cedar top paired with mahogany back and sides. The mahogany neck is a pleasure to play and, combined with a warm and mellow tone, it’s versatile for most styles of nylon-stringed music. Throw in some good tuners, a bone nut and saddle, and an excellent Cordoba Polyfoam Case, and you have a very solid choice. Check out our full review of Cordoba’s C9 for everything you need to know. A wildcard on this higher-end list, although worth considering if you appreciate modern playability, versatile electronics and something a little different. In a world where many classical guitars look like replicas of one another, the ESP LTD TL-6N breaks the mold, using the Japanese brand’s classic EC shape, with a top made from spruce, and mahogany making up the bulk of the thinline body. There’s also a mahogany neck, with a nut width of 1.89”, and a rosewood fretboard holding 22 easily-accessible frets. While pretty quiet acoustically, the guitar is fitted with a B-Band T-7 preamp and an undersaddle B-Band transducer, which is very versatile through an amp. Check out our full review for all the details of ESP LTD’s TL-6N. If you’re spending around a thousand bucks on a classical guitar, chances are you’re no beginner, and you know what to look out for. So there’s no point in us telling you to look for a spruce-topped electro-acoustic, when you really want a traditional cedar-topped guitar with no electronics! But there are still a few general considerations. Such as the fact that guitars in this category have less room to make mistakes. Sure, we can forgive shaky tuning stability or a few blemishes if you’re paying up to $500, but as soon as you start spending close to a grand, the manufacturer should be producing a near-perfect guitar. And while you do get a few duds, the general quality in this range is great. Manufacturers such as Cordoba, Yamaha, Kremona, Godin, Takamine and Taylor all shine, producing a range of traditional models, as well as some with a little more flair – just check out the ESP LTD TL-6N on our chart! Cedar, spruce, rosewood and mahogany are still very much the primary woods used in body construction and the combination you go for will be down to the tone you prefer. Most notably, you will start to see more all-solid-wood guitars in this price range, especially when electronics are not involved. On that note, electronics are more common in this market as players tend to want to use such a playable, great-sounding guitar to perform on stage/record with. Plugging into an amp, then, becomes much more important. You’ll find the electronics are more advanced and versatile in this sub-$1000 range, with systems like Fishman and B-Band performing well, allowing you to shape your sound to match your style. A final word on craftsmanship and playability – these two things should be near perfect at this price point. Asian-made models are still pretty common, but they feel much less mass-produced than the factory line models you see in lower price ranges. Regardless of where and how it’s made, the guitar should show no flaws and it should feel smooth and slick to play straight from the box. As we’ve recommended many times on this site, buying a used guitar can be an excellent route to explore – especially when you have a grand in your pocket. Chances are you can get a great bargain, without spending your entire budget. However, be aware of the risks. Are the electronics fully-functional? Has the guitar been dropped or damaged? Has it been stored correctly? Can you examine and test it properly before buying? If you’re buying from a reputable online or physical guitar store you shouldn’t have any trouble – especially with a warranty and returns policy. Unless you’re rich, spending up to $1000 on a guitar is not usually done on a whim. So spend some proper time making your decision. Even if you’ve fallen in love with a particular guitar, read reviews, watch videos, and – if you can – try it out. Ultimately, be picky – you can afford to. Good luck with your hunt for the perfect guitar!